Thanks for the yummy entry. I use this to prepare lemon sevai and coconut sevai too. Wow...saw those recipes. Look lovely. If you are referring to idiappam or vermicelli, it is slightly different and looks more like noodles. Rice sticks looks exactly like vermicelli and can easily be mistaken for the latter. Rice stick upma is colorful and inviting. the peanut coconut powder makes it very interesting! lovely! I have some rice sticks that I bought a while back. Was wondering what to do with them. I will try this for breakfast tomorrow. Rice Sticks...At first I thought it is vermicelli...Will check out more...Your rice sticks upma looks so perfect...The rice sticks are cooked so perfectly, it is very easy for this to get mushy...But this is done perfect. 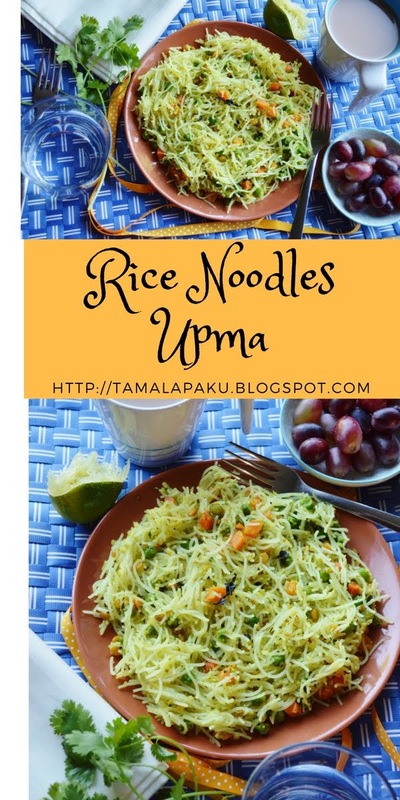 Tried this kind of upma with vermicelli, but never used the rice sticks so far, It looks so good and you have prepared them so well with each sticks cooked separately . Picture looks fabulous Harini. Love these sort of simple and filling meal at any time of the day. Looks really yummy and filling too. It is the same rice noodles that we sometimes get for Chinese noodles? The upma looks so yum Harini. Are these the same as rice sevai? This one is a family favourite....we usually have it for Sunday dinner but it is a good dish for anytime of the day. Lovely pick! I was thinking these were vermicelli. Looks yum. I also thought those were rice vermicelli but the sticks seem even more perfect to make the upma. Yummy sevai recipe.. perfect for lunchbox.